Welcome to the Hampshire Gymnastics School Pre and Competitive Team. It is with great excitement that we begin a new year and a new competition season. We thank you for encouraging your daughters to participate in the beautiful sport of gymnastics and we thank you for giving us the opportunity to coach them. This handbook has two purposes. First, it serves as a guide to help new parents and their daughters make the transition from recreational gymnastics to pre or competitive team, and second, it is a reference book for all of our team rules, expectations and coaching philosophy. Hampshire Gymnastics School is a member of USA Gymnastics, the national governing organization for the sport in the United States. USA Gymnastics sets the rules and policies that govern the sport and is responsible for selecting gymnasts to represent the USA in international competitions, world championships, Olympic Games, etc. Within USA Women’s Gymnastics there is the Junior Olympic Program and the Elite Program. The athletes from this group can be selected for the National Team and for international competitions. They adhere to international competitive rules and standards. Becoming an elite gymnast requires an enormous commitment from athletes, families and coaches. Most elite gymnasts train more than 20 hours per week. The Developmental Levels 1 through 3 may be used as a non-competitive and achievement-oriented program for use within a gym’s pre-team program, or they may be used as an introductory/recreational competitive program. States may also offer State Championships for these levels. The third segment is Optional Levels 6-10. Levels 6-8 have difficulty restrictions, while Levels 9 and 10 have no restrictions in the skill choice. Level 6 has competitive opportunities up to and including State Championships. Additional competitive opportunities are provided for Levels 7-10, with the Level 10 competitive season culminating at the Jr. Olympic National Championships, Level 9 at the East or Western Championships and Level 7+8 at the Regional Championships. Is pre-team and/or competitive gymnastics right for my daughter? In order to answer that question, each parent should consider the ‘big picture’. The benefits of gymnastics training are life long. We see a large difference in the maturity of our team/pre-team girls compared to that of their peers in recreational gymnastics. And here’s why: Competitive gymnastics training requires work that is strenuous and demanding. The time commitment is greater than most all other youth sports from a very young age. There are hard practices, sore muscles, ripped hands, injuries and lots of frustration. All of these things amount to daily challenges (and growth) that many of their peers have not experienced. No matter how far your child gets in the sport – whether she stays at the pre-team level or makes it to the Olympics – the lessons about life last forever and that is why we know it is all worth it! Hampshire Gymnastics Team coaches LOVE gymnastics. For us, coaching is the career we have chosen. We pour most of our waking energy into thinking about gymnastics, planning our practices, analyzing gymnastics videos, thinking of new drills, etc. We communicate, we respect each other, and we strive to combine our strengths and our knowledge in a way that will help each gymnast be the best she can be. Hampshire Gymnastics strives to teach life lessons through gymnastics training. Generally, the team coaches will select girls from our recreation program and invite them to join the competitive team. Their selection is based on physical talent (strength, flexibility, body coordination) and personality/work ethic. Physical talent is the top consideration when selecting girls to the pre or competitive team because we want each team member to have the chance to succeed. Essentially, if we feel that there are too many physical challenges that a child will face in their quest to do competitive gymnastics, we do not want to ‘set them up for failure’. The years on the pre-team are spent developing the strength, flexibility, body control and skills needed to compete in level 3 or 4. It is also a time of adjustment as the girls get used to the differences between recreational and competitive gymnastics. The training that the girls must do in order to perform difficult skills correctly and safely is often “boring”. A gymnast may spend 20 minutes at a time working on a body shape, conditioning exercise, drill, etc. This strict and repetitious training is something they are not used to because the main focus of recreational classes is having fun. The “fun” part about being on the (pre)team is experiencing the satisfaction that comes with achieving a skill or performing a routine that the gymnast works so hard to perfect. Occasionally, parents and gymnasts have told us that, after the first practice with the pre-team, they never want to come back. Usually, if they can stick with it for a few weeks, and allow their body to adjust to the workouts, they find that they still love gymnastics and cannot wait to come to practice. Here at Hampshire, we start competing with level 3. Ideally, a gymnast should spend one or two years at each level. While it is our goal to have each child progress at this rate, there are some cases when (for various reasons like strength, flexibility, size, coordination and even effort) a particular skill or routine takes longer to learn. If your child is having significant difficulty with a routine or skill, we may ask her to remain in her current level for another competitive season. Similarly, if a child is progressing more quickly than normal, we may recommend moving through two levels in one year. Hampshire gymnasts actually practice less than many other teams. Therefore, it is vitally important that we use utilize every moment spent in the gym. We cannot emphasize enough how important it is to be on time to practice. Much of our conditioning and injury prevention exercises take place at the beginning of practice. Therefore, lateness, especially on a regular basis, is extremely detrimental to a gymnast’s training and may slow her progress towards the next level. Being on time means arriving at the gym with enough time to go to the bathroom, do hair, eat a snack, etc. before line-up. When is it OK to miss practice? Besides the obvious (weddings, funerals, sickness, etc) it is OK to miss practice for things like family vacations, special events and homework! We frequently remind the girls that school comes before gymnastics. If they have a big project to finish, or an exam to study for, they should ALWAYS stay home (or leave the gym a little early) and do that first. Also, if there is a birthday party, or a dance, please miss practice to attend those events. We want the girls to have balanced lives and they should not feel like they can never miss a day of gymnastics. That said, missing practice SHOULD NOT be a regular occurrence. If you are going to miss practice, please call the gym or inform the coaches in advance. Being prepared for practice will help a gymnast to utilize all of her time spent in the gym. The following items should be kept in a gym bag and brought to every workout. After joining the team or pre-team, summer practices are REQUIRED. If you do not attend summer practices, you will not be allowed to continue on the team or pre-team in the fall. We know that girls will leave for family vacations, etc. but we expect that they will be at practice for the majority of the summer. Every gymnast must pay for the entire summer even if they are going to miss for vacation. Deducting portions of summer tuition for missed practices is not allowed. Specific information regarding practice times and fees will be distributed near the end of the school year. We require competitive team members to attend ALL meets on the schedule. In the gym we strive to develop the most complete gymnasts possible. Meaning, our training revolves around learning a wide variety of basic skills, developing optimal strength and flexibility, and correcting individual physical weaknesses/imbalances. But that is only half of the picture. Without proper nutrients, the full affects of training cannot be realized. A gymnasts food choices, as well as when and what to eat, are as important as her training. Training without good nutrition (or good nutrition without training) will yield poor results. The book below is highly recommended for all team and pre-team families. Also, check out Dr. Alan Goldberg’s website, www.competitivedge.com. There is a variety of free articles relating to competitive sports and resources/products specifically for gymnastics. Please make all checks payable to Hampshire Gymnastics School. Monthly tuition can be combined with other payments such as meet fees, leotards, coaches’ fees, etc. Please note the breakdown in the subject line. Monthly tuition is due on the first practice of each month. Please make checks payable to Hampshire Gymnastics School. A $10 late fee is charged if payment is not received by the 10th of the month. We reserve slots in competitions months in advance. We will bill gymnasts for their meet entry fee so we can send in our reservation before the due date. We will not enter an athlete in a meet if their entry fee is not paid by the due date. Each gymnast will start the school year with those two (or three) meet fee deposits, or basically a ‘bank account’. We then start entering the meets and other charges into their profile, $95 ABC Meet, $115 Competition Meet, $152 team leotard, etc. As soon as they use up that initial deposit, we will send a bill for the balance due. If there is any credit remaining at the end of the competition season, it can be applied to a monthly tuition payment. Each coach is paid $60/meet session. They are also reimbursed for gas mileage, tolls and other travel expenses. Coaches’ expenses are assessed after each competition, divided by the number of girls on the competitive team, and then billed to the parents. For Regional or National Championships, the coaches’ fees are also divided among the entire competitive team. This is why you may receive a bill after your child is done with their own competitive season. Announcements and information will be distributed in at least two of the following four ways: verbally from the coaching staff, a flyer sent home, on the team board in the lobby and through email. If practice is cancelled due to snow or bad weather there will be a message on the gym phone, and a post on our website. If you need to speak at length with any of the coaches regarding your daughter’s workouts, progress, injuries, etc. please do so after practice or by appointment. Short conversations can be had before practice and are very helpful in coaching each individual child through daily challenges. You must have a USAG membership in order to compete. 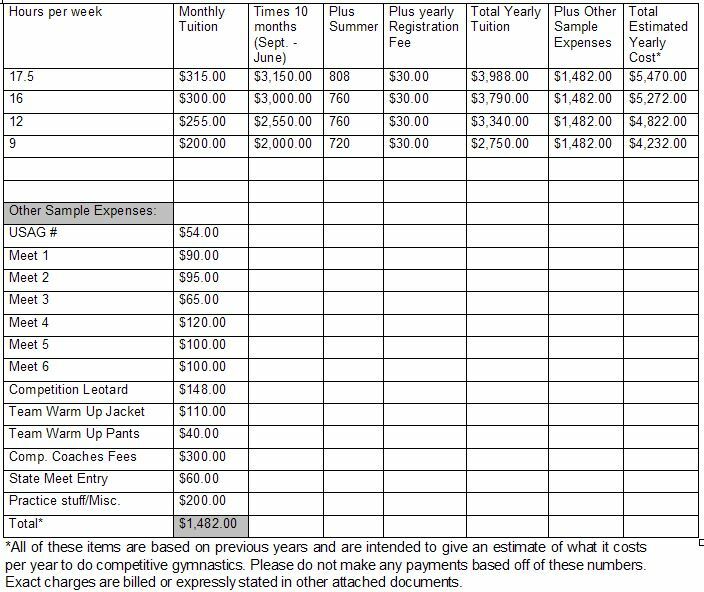 All competing gymnasts will be billed at the beginning of the school year to renew their current or get their new membership. Competitive team members need a competition leotard and warm up suit. These are ordered well in advance of the competition season as they often take months to arrive. A team bag can be ordered on your own and at your convenience from LL Bean. Please order “Bean’s Adventure Duffle” (solid black) in a small or medium size with “Hampshire” embroidered in white BU (block uppercase). Do not include the quotation marks in the embroidery. We will post workout schedules for holidays on the team board as soon as they are planned.